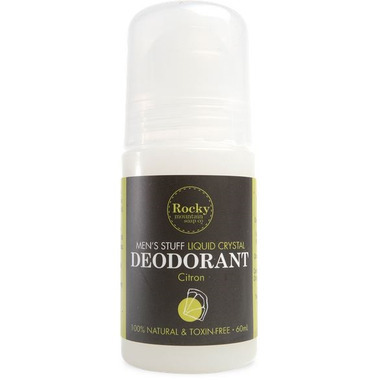 Rocky Mountain Soap Co.'s all natural deodorant for men is made of natural liquid crystals. It smells great, is toxin free and it just works! This deodorant is the only one in the line that works for me. For some reason I am unable to use any deodorants with essential oils (even the best ones) for any brand except this one as the others give me a rash. I don't know if there is anything real difference between the formulas of the different scents but this deodorant "for men" works for my husband but not for me (a woman). I use the tea tree one and it works great for me and my husband uses this one and it works great for him! So if this one doesn't work, try a different scent and maybe that one will be better. I didn't find this deodorant worked AT ALL! Even just an hour or two later I was starting to stink. Really disappointed... still haven't found a good natural deodorant yet. I bought this deodorant for my husband to try who's been resistant in the past to switch from conventional to clean & safe ingredient deodorants. We're already fans of other Rocky Mountain Soap Company Products so I had faith that he'd like this and he does. A convert! Definitely repurchasing.